Those who love nature and want to enjoy a luxurious yet rustic and eco-friendly retreat would be hard pressed to find a better option than this idyll in the fringes of Cairngorms National Park. Three beautiful eco-cabins can be found here, each of which is a haven with everything you require for a relaxed stay. Those staying here can enjoy the use of a wood-fired hot tub and sauna. Guests can choose to stay in the tiny hostel, which sleeps eight and can be booked for exclusive use. Couples can also choose to stay in the Woodsman's Hut, the Duck's Nest or the Lambing Bothy. Each has its own distinctive charm. The Woodsman's hut has a peat-fired chiminea burner and is ideal for tree-huggers, as it is nestled in a charming forest location. Those who enjoy watching the wildlife may love the Ducks Nest, a waterfront hideout with a sunny deck, perfect for wildlife watching or photography. Finally, animal lovers may choose the Lambing Bothy, which is surrounded by pastoral scenes of gardens, clucking hens and bleating sheep. After a long day out exploring the breathtaking forests and mountains of the surrounding area, what better way to relax and unwind than with a soak in the wood-fired hot tub. Red squirrels and other local wildlife may even stop by to see what you are up to. Also ideally located for exploration of the northern portions of the Cairngorms National Park, Wolf Lodge is located in a quiet hamlet of just five dwellings within easy walking distance of the village of Carrbridge. In a quiet and tranquil woodland setting, this romantic accommodation option features a fabulous outdoor hot tub, a cosy log stove and sauna, and a lovely place to sit outside on a south-facing patio and barbecue area. Wolf lodge sleeps four, perfect for families with a couple of kids, or for couples looking for a romantic retreat, and you may also bring up to two dogs with you. There are two bedrooms, a double gallery bedroom and one bunk room with two bunks, as well as a lounge with log burning stove, dining area and galley kitchen. To keep everyone entertained, there is WiFi and Freeview available. Nearby Carrbridge is a quiet and friendly village – an alternative hub to busy Aviemore for visitors to the national park, where many different outdoors adventures await throughout the year. One amusing fact about Carrbridge is that, each year in October, it hosts a competitions to find the world's best porridge maker. The railway line runs through Carrbridge, making it easy to reach this destination, and also to travel to other places across this part of the country. If you are looking for something a little bit different then how about an octagonal luxury treehouse, with its own private hot tub and amazing mountain views? Amongst other self-catering accommodation, Dalnoid offers the opportunity to stay in one of two luxurious treehouses in stunning Glenshee. Each of the treehouses is set it its own secluded hillside location, and features not only a hot tub but also a wood burning stove, luxurious bathroom and fully equipped kitchen. These treehouses are not suitable for children or dogs, but could be ideal for a romantic couple's stay. The Scots Pine treehouse is one of the two options. You will reach this treehouse by means of a secret archway and bridge through the trees. 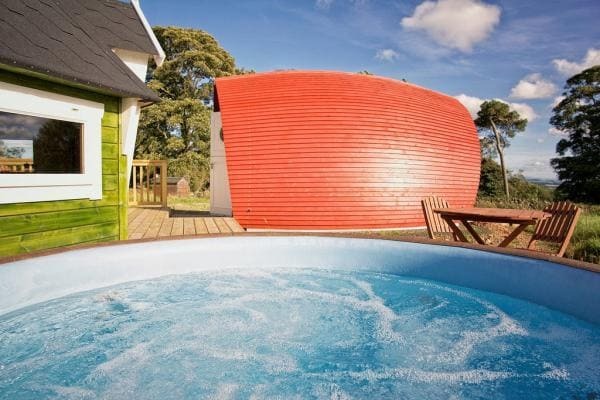 Outside, the hot tub is located on a decked area looking out towards the Cairngorm Mountains. The Silver Birch treehouse is the second option of the two. It is accessed down a magical fairy-light lit path leading between birch and hazel trees. In this treehouse, the hot tub is reached by means of a spiral staircase from the deck, through an arched hedge-way into a secluded spot where you can enjoy amazing views. The treehouses are roughly equidistant between the small village of Blairgowrie, and the ski resort area at Glenshee. Whether skiing in winter, hiking in summer, or enjoying other outdoor activities in the Cairngorms national park, this could be a perfect base from which to enjoy your adventures. Boutique Farm Bothies offer two accommodation options in the rolling farmland of Aberdeenshire. This pastoral idyll offers the chance to enjoy an eco-friendly stay in a lovely rural area, in one of two unique, bespoke bothies constructed largely from reclaimed and upcycled materials. Each bothy is a tranquil haven, with rustic charm, and both offer the luxury of a private, wood-fired hot tub. The Barley Bothy sleeps four in two king sized box beds and is perfect for a family. It has a vintage flushing toilet, a roll-top bath, a Jotul stove for heating and electricity for low-key lighting and for charging appliances. There is a veranda with a rocking chair which provides the perfect place to relax and unwind. The Sheep Shed is a cosy couple's retreat. It sleeps two on a king sized bed on a mezzanine, which has an amazing star gazing window. A solar panel provides romantic lighting and a phone charging point. There is a comfy, long, tin trough bath and a flushing vintage toilet, and wood fired cooking range which also heats the water and the space. The bothies are located on a picturesque family farm, which grows strawberries and barley for the whisky industry and rears sheep. There is plenty to do in the surrounding area. Whether you enjoy castles and history, walking and hiking on the coastline and in the hills, exploring the local food and drink scene, or fishing and other outdoors activities, Aberdeenshire could be a great holiday destination. At the edge of Culbin Forest on the beautiful Moray Coast you will find this charming cabin amongst the pine trees. Here you can relax on the cabin's outdoors deck and watch the wildlife, or chill out in the wood-fired, cedar hot tub. The calm, contemporary cabin accommodates four guests and has everything required for an enjoyable and comfortable stay. There is a bright and spacious open plan kitchen and living room area, part of which can be partitioned off to create a second bedroom with a sofa bed, as well as a separate master bedroom with a king sized bed. There is also a bathroom with a walk-in shower. Well behaved dogs are welcome. While, in this beautiful area, you are unlikely to want to spend much time indoors, for rainy or inclement days you could also hole up and snuggle down in front of the flat screen TV, or enjoy the free WiFi. For £40 you an enjoy use of the wood-fired hot tub during your stay. Right on the doorstep you will find plenty of excellent walking and cycling trails in Culbin Forest. Brodie and Cawdor castles are within a few miles. You can visit the idyllic Findhorn Ecovillage, enjoy the coastline, perhaps heading as far as Pennan, where scenes in the film 'Local Hero' were shot. You could also head south into the Cairngorms for plenty of outdoors adventures. This is also a great area for golf, with a number of local courses to choose from. The Rowan Pod is a cute and quirky little hideaway for two in the Scottish Borders, around 45 minutes south east of Edinburgh. The bed can be laid out as a double or as twin beds, and turn into a relaxing place to sit and to eat during the day. The space is well-insulated, allowing for a cosy stay year round, and has underfloor heating throughout. There is a small TV, a sound system, a small fridge, coffee machine, kettle and toaster. There is also an en suite shower room. Adjacent to the Rowan Pod you will also find a barbecue hut which is perfect for cooking in all weathers, as well as a lovely outdoors hot tub. While this romantic little hideaway is something a little different, visitors here could also choose to stay in one of the site's five star luxury lodges, each of which has its very own hot tub. The largest option sleeps up to ten, two options sleep six, one sleeps four and the smallest, The Lodge, is another perfect getaway option for two. A farm shop on the site at Airhouses offers a range of local produce, ready-made meals, gifts and cards. There are, amongst other things, free range eggs from their own hens and bantams. In the surrounding area, you will find plenty to do, whether you head north west to Edinburgh, north or east to the coast, or southwards to explore the castles, historic abbeys and other attractions of the Scottish Borders. The cabins at Strathyre offer luxury accommodation in a beautiful setting encircled by mountains, forest and loch. Each of the luxurious lodges enjoys a private hot tub. Some have enchanting views over Loch Lubnaig, while others are arranged in a grassy glade between the loch and the forest. A range of one to four bedroom options are available, each of which comes equipped with all the basics, plus added luxuries to insure that you enjoy a comfortable and relaxing stay. Some of the cabins, for example, have log burning stoves, decking with a gas barbecue as well as the hot tub, a hammock, a large sunken bath and many other special features. Many of the cabins available are perfect for families, and there is even one wheelchair adapted two-bedroom cabin, with special modifications including a host to enable wheelchair users to make use of the hot tub. At the heart of the complex of cabins at Strathyre is the Forest Retreat, where you will find a range of amenities including a laundry room and a pay area for the kids. At the Forest Retreat, you can hire bikes, book activities, or meet with the Forest Ranger. Strathyre is a natural playground for nature lovers, with awe-inspiring mountains and forests and lochs that are a perfect backdrop for a wide range of outdoors adventures. Visitors to this region can explore the Loch Lomond and the Trossachs National Park and get to know this stunning part of the country. A blissful eco retreat on the banks of Loch Garry, nested amid breathtaking scenery of mountains, moorland, and lochs, this hideway is a beautiful log cabin with a cedar deck with barbecue and pizza oven, table and chairs. A stay here includes private use of a large hot tub. The cabin benefits from the latest innovations in sustainable energy, with underfloor heating powered by an air source heat pump, which also provides hot water. Pure rainwater is harvested from the roof and filtered to provide the cabin with fresh water. The cabin has a master bedroom with a king sized bed, and a further gallery bedroom which sleeps up to four. There are two wetrooms, one bathroom, a well-stocked kitchen and utility room, and a cosy lounge with a log burner, Sky TV and DVD player, and comfortable, relaxed seating. A self-contained Bunk House and Shepherds Hut are also available in conjunction with the cabin. Glen Garry is a picturesque location, perfect for hiking and other outdoors exploration. Within easy driving distance, there are plenty of natural beauty spots to explore, and Loch Ness and Urquhart Castle are less than an hour away. This place could also be a perfect spot off, perhaps, en route to the beautiful Isle of Skye, or a short detour off your route if you are taking a trip up the Great Glen. If you are looking for luxury cabins with hot tubs then one great option are these beautiful little lodges in a charming riverside location could be perfect for you. The little cabins offer not only personal hot tubs on tranquil river bank verandas to enjoy during your stay but also other little luxuries like Egyptian linen bedding, fluffy towels and a complimentary continental breakfast, with fresh milk, croissants and other courtesy items refreshed each morning. In a space of just 12 square metres you will find a bedroom, ensuite shower room, kitchenette and lounge area. Every square inch has been cleverly considered and brilliantly designed to make the most of the space. Here, the aim is to provide the luxury of a castle in a tiny cabin – perfect for a romantic retreat for two. Each cabin is reached by means of a short, private walkway into the woods, with views of the adjacent golf course and Loch Linnhe beyond. Guests staying in the cabins will have 'after hours' access to the Golf course club house,enjoy the club house cafe and get priority tee times on the course. They can also enjoy a 10% discount on adventure activities such as Segway tours, archery, laser clay, and more at Glencoe Activities. Dramatic Glencoe, with its fascinating history and many walks and hikes, is just moments away, and nature lovers will find plenty in this area to enjoy. Just a stone's throw from the bonny, bonny banks of Loch Lomond you will find a collection of luxury, five-star lodges with their own private hot tubs. There is a collection of lodges in the style of luxury holiday cottages, which sleep between two and six people. Up to two extra beds can also be supplied for children aged between two and ten and cots are available for children under two years. The lodges have stunning views out over the loch. All of the lodges are kitted out to the very highest standards, with hints of Scotland throughout. Two of the lodges are pet-friendly, and all come with bedlinen, towerls and a range of luxury features. Hot tubs are included in the price of your stay at the Cawdor, Culsean, Lismore and Mount Stewart lodges, and can be hired at extra cost in other options. These hot tubs are the perfect place to relax with a glass of champagne in hand and enjoy the fabulous views. The lodges are perfectly situated for those who want to enjoy the attractions and activities on and around Loch Lomond, and throughout the Loch Lomond and the Trossachs national park. Read our guide to the most popular places in Scotland. Looking for hotels in Scotland? Use our search partner to guarantee the best price.